Three major cities in China – Hong Kong, Macau, and Zhuhai – will soon be connected by a series of bridges, tunnels, link roads, and boundary crossing facilities, providing a new direct link between the east and west banks of the Pearl River Delta for passenger and freight land transportation. At the expected cost of approximately $10.6 billion U.S., the construction of the massive Hong Kong-Zhuhai-Macao Bridge project began in December 2009 and its completion is planned for late 2016. However, it faces daunting challenges as they combat nature to build and stabilize an artificial island that is central to the project. A major project component is the Hong Kong Boundary Crossing Facilities (HKBCF) that will serve as a transportation hub and provide clearance facilities for goods and passengers using the bridge. The HKBCF is located on a 150-hectare artificial island that was reclaimed from open waters just northeast of the Hong Kong International Airport. The landing points for the link roads and tunnels will utilize 20 hectares of the island. The remaining 130 hectares will be used for the HKBCF cargo, passenger, and vehicle inspection facilities; offices for the immigration, customs, and excise departments; road networks; and a public transport interchange and traffic control surveillance system. The artificial island’s sea wall was built using a new, non-dredge approach. Large 30-meter-diameter steel caissons were dropped into the sea a few meters apart and joined by a flexible steel wall. As the mud was dug out from the middle, each 450-tonne caisson drove itself down towards the hard strata. This new reclamation technique was used instead of the conventional approach of dredging out the soft mud down to the bedrock and replacing it with marine sand. Additional ground strengthening measures were also needed to help stabilize the island’s soft marine mud before constructing boundary crossing facilities and tunnel landing points. Trevi Hong Kong joined these stabilization efforts by installing jet grout columns in a key area of the island. Trevi Hong Kong installed 450 jet grout columns with diameters ranging from 1.2 metres to 3.0 metres to a depth up to 35 metres. The jet grouting was performed by drilling a hole to the required depth, followed by rotating and extracting the drill rod while simultaneously pumping high-pressure fluid through nozzles at the foot of the drill string. A combination of air and cement grout slurry was injected as the breaking-up and consolidation agents, using the TREVIJET T1/S bi-fluid system. 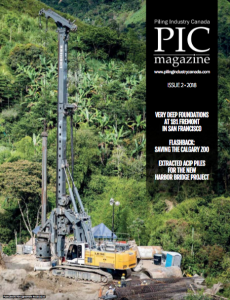 Five Soilmec 7T-600J high pressure pumps with four-inch pistons were used to install the large-diameter grout columns and a single Soilmec 7T-505 pump was used for the small-diameter columns. Six Soilmec PSM-20 hydraulic drilling rigs were deployed for this jet grouting construction. The drilling rigs were all equipped with a monitoring system that displayed on a built-in LCD screen and recorded on a dedicated memory disk the main drilling and jetting parameters, including depth, drilling rate, string revolution speed, drilling torque, grout pressure, grout and air flow rate, drilling and jetting time, column deviation, and x and y inclination. The artificial island’s geological conditions challenged the stabilization efforts. The top ground layer of about 8.5 metres of sand fill is followed by approximately 18.5 metres of very soft marine mud. 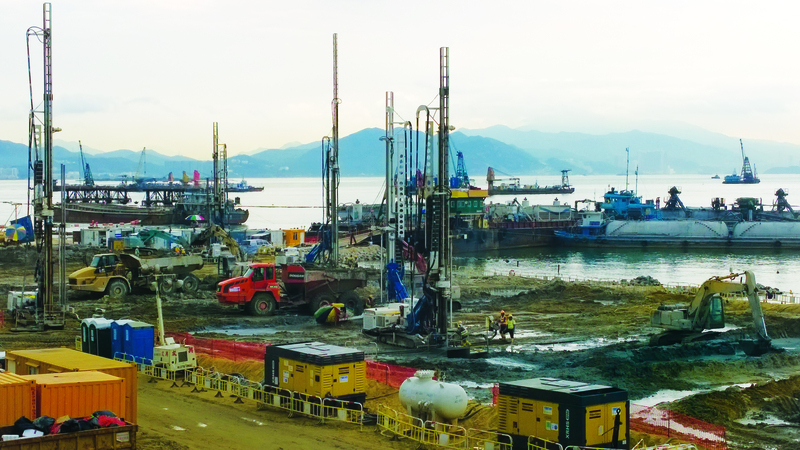 Trevi Hong Kong needed to penetrate through the soft sand fill and marine mud into at least one metre of the Alluvium material that rests below. 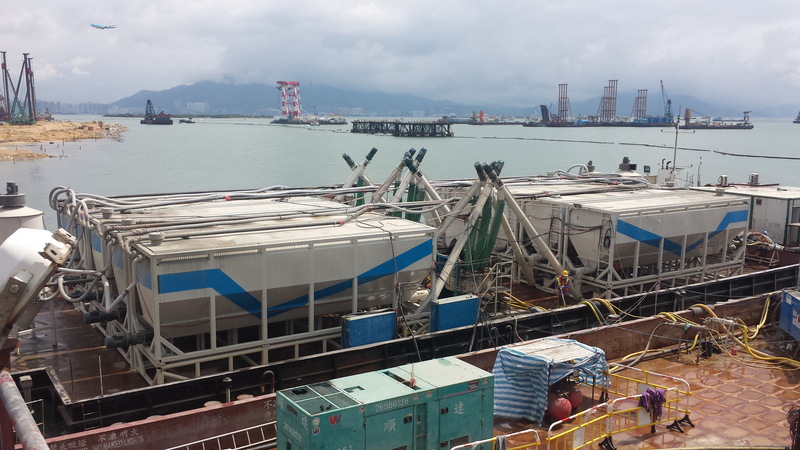 The Soilmec drilling rigs performed beautifully, helping Trevi Hong Kong maintain an aggressive production schedule of at least eight jet grout columns per day. Trevi Hong Kong performed the jet grouting on a very tight schedule within 2.5 months. This translated into a demanding schedule for supply delivery to the island, given the required high rate of cement consumption. Trevi Hong Kong used four barges with a capacity of 1,200 tonnes to transport cement from a factory in China to the jobsite on the island in order to prevent any interruption or delay in cement supply. Two additional barges were equipped with 14 horizontal silos, each with a capacity of up to 600 tonnes of cement, and four grout mixing plants. Sea water was used as the water source for drilling and mixing the cement grout. Given this setup, Trevi was able to produce up to 1,200 cubic meters of cement grout per day. 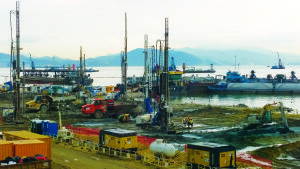 Trevi Hong Kong was awarded the subcontract for the jet grouting in the middle of March 2015, and the work was successfully completed ahead of schedule on June 15, 2015. Trevi’s speedy construction of the jet grout columns was greatly appreciated by their client, the main contractor.